Home weather stations are getting more accurate and sophisticated all the time. Follow our buyer's guide to ensure you're not left in the cold or soaking wet. Everyone has their own morning routine. Some of us go for a run, others get the kids ready for school, some just want to know if it will be smooth sailing during their rush-hour commute. The weather can throw a monkey wrench into any of those plans. 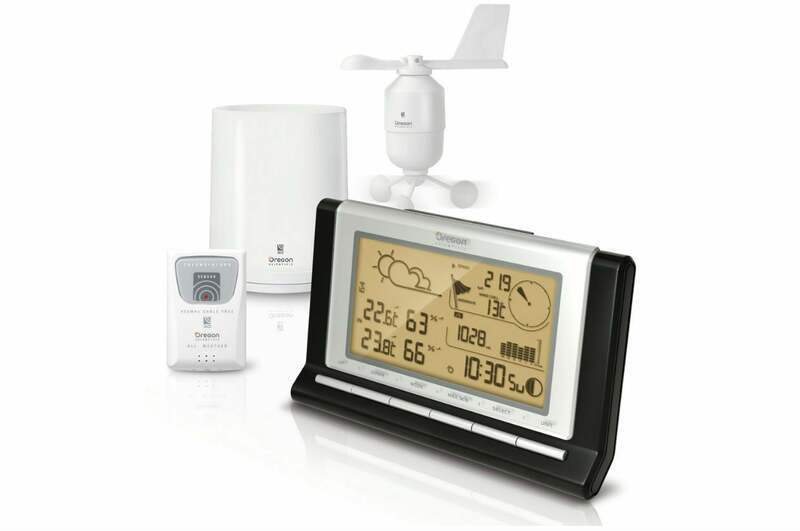 Ambient Weather hit a home run with the WS-2902 Osprey weather station. It’s an impressive value, and its smart home connectivity is icing on the cake. Just about any of the home weather stations we’ve evaluated will meet the needs of the casual weather observer, but Ambient Weather’s WS-2902 Osprey delivers more sensors than what you’ll get with most other packages, and it offers great hooks into smart home infrastructure such as IFTTT, Amazon Alexa, and Google Assistant. Highly recommended to anyone interested in monitoring the weather around their home, and especially for enthusiasts who want their smart home to respond to atmospheric conditions. The AcuRite Atlas is a great value in personal weather stations with near prosumer-level accuracy. It still needs more smart home capabilities, however, and hopefully the lightning detection isn’t as glitchy as some claim. AcuRite’s Atlas packs a ton of features into its home weather station, which reports highly accurate results when installed according to best practices. 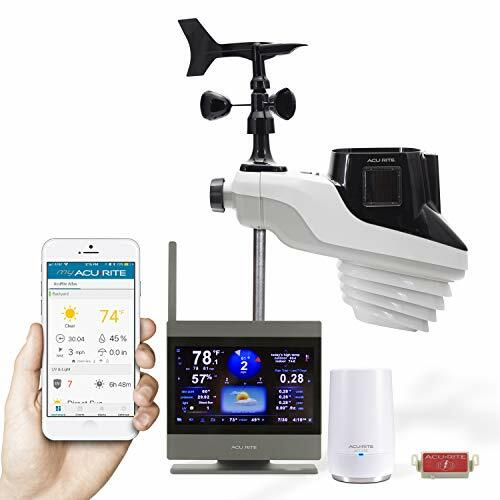 You’ll need to pair its 5-in-1 sensor kit with either AcuRite’s touchscreen display (for local readouts) or the AcuRite Access (for remote access via the internet), but you can get all three devices bundled with a lightning detector for around $260 on Amazon. If AcuRite supported more smart home systems, it just might knock Ambient Weather off its perch as our top pick in this category. We test weather stations over a period of at least one month to ensure we get the widest possible array of weather conditions to see how the station performs. We paid special attention to ease of use and installation, and also used nearby National Weather Service stations to judge accuracy. Weather conditions can vary dramatically in just a few miles, so with temperature we judged readings of within plus-or-minus two degrees, and all other measurements within a five percent tolerance of the NWS station as accurate. We also evaluated each system’s ability to connect to and influence smart home systems. Which platforms are supported? Can you use voice commands? Did it work as expected? Finally, we examined durability. With instruments being out in the elements 24/7, this is a very important factor to consider. At a minimum, a basic weather station should report temperature and humidity, inside and outside your home, and barometric pressure outside your home. A mid-priced station will measure wind speed and direction, as well as rainfall. A high-end model should deliver all of the above, plus other specialized measurements such as UV index, soil moisture, and water temperature (think your pool or a koi pond, for example). 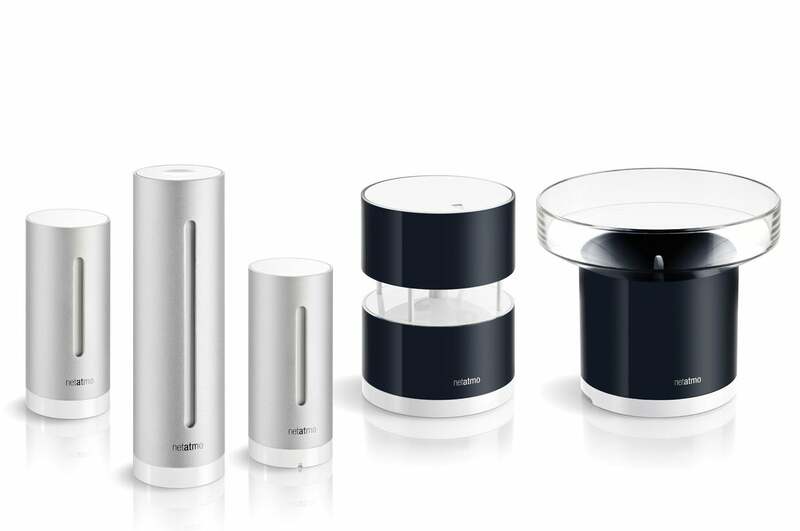 Netatmo Weather Station comes with the base station and one indoor/outdoor temperature/humidity sensor, but you also need the rain and wind gauges to really enjoy this station’s capabilities. As with any product, spending more money doesn’t necessarily guarantee you’ll get a great product, but we’ve yet to find a cheap weather station deliver genuine value. The vast majority of the budget stations available at chain discount and hardware stores are inaccurate. While temperature is generally accurate to within a degree or so, humidity is poorly measured, and readings can be 10 to 15 percent off actual values. Mid-range and high-end weather stations are typically much better, and in my experience never more than about five-percent off most of the time. Wind and rain measurements are very useful, especially if you have activities affected by that type of weather. High-end stations are nice to have if you can afford them; they’re typically the most accurate, but unless you need specialty measurements—UV, soil moisture, and the like—don’t spend the money. Accuracy: By far the most important, accuracy is also the hardest to gauge. Here we’d recommend looking at the spec sheets and choosing stations with low margins of error. Additionally, look through user reviews (or ours) for real-world testing. Not all weather stations are built the same, and a high price doesn’t always mean high quality. Battery or solar power? Just about all weather stations these days operate wirelessly, so your instruments will run on either battery or solar power. Avoid stations that rely mostly or solely on solar power, as a few dreary days can prevent the instruments from have energy stored to do their job. Battery-operated or solar-assisted units are the best choice—you might need to change the batteries once a year. Internet connectivity: If your weather station can connect to the Internet, you’ll not only be able access it while you’re away, typically through an app or a special website, but you’ll also be able to share your data with the world via services such as Weather Underground. Meteorologists might need your data, especially if you’re in a place where their weather stations aren’t! 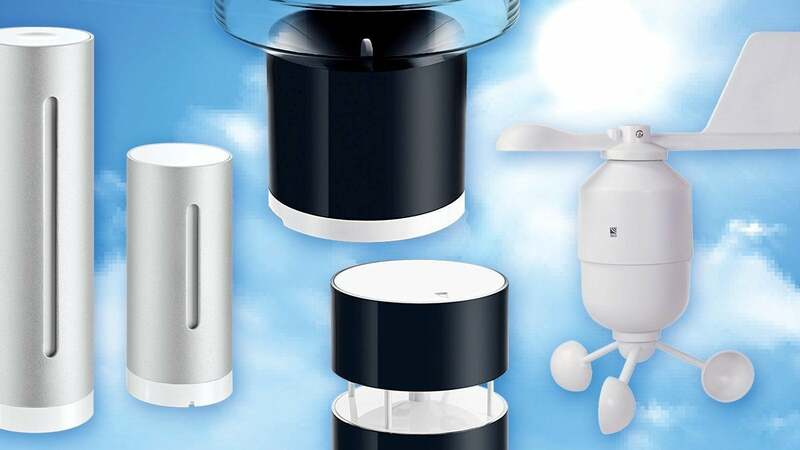 Smart home support: Personal weather stations can make your smart home even smarter. If you already own a connected-home system, look for a weather station that’s compatible with your setup. Some stations now support automation services like IFTTT, so you can turn on your heater when the temperature gets too cold, or your A/C if it gets too hot. Others are compatible with Amazon Alexa and Google Assistant, allowing you to ask for highly localized weather reports. Expandability: Your weather station might suit you fine now, but your needs could change later. Instead of going for all the bells and whistles up front, save some cash and buy mid-range product that can be expanded with new and different sensors down the road. That way, you’ll never outgrow it. Durability: The elements can be harsh, and your sensors will be in it 24/7. Inexpensive stations are constructed from low-grade plastic that will quickly deteriorate. Look for a well-built station, and stay from “all-in-one” units where all the sensors are in a single housing. The sensors represent the bulk of the cost, and if one fails, you’ll need to replace all of them—even if the others are working just fine. Oregon Scientific’s WMR89A comes with all the sensors you need right out of the box, with no need to buy anything additional for basic local weather reports. Now here’s where my meteorologist side comes out. Please, please, please choose carefully where you place your instruments. The temperature and humidity gauge should be placed in an shaded and grassy area about eye-level height off the ground (National Weather Service specifications say five feet), and out of direct rain or snowfall. Do not place it near or above concrete, macadam, or other potential heat radiators. This means your bedroom window, too: warm air escaping from your house will throw off its readings. For the rain gauge, the level you place it at isn’t as important. What is important is that it’s not placed too low, so that splash-back from the ground causes abnormally high readings, or near tall obstructions that might block rainfall in windy conditions. The NWS generally recommends you place the rain gauge as far from obstructions as they are high. That’s tough to do, so just put it in as clear of a spot as possible. The anemometer (the fancy name for the wind gauge) is the toughest instrument to place. Most people are surprised to find out that the wind speed readings you see on TV are taken at a height of 33 feet above the ground. That’s not practical for most of us, but try to get it 10 feet above any nearby obstructions if you can. You’ll also need a compass nearby: you’ll need it to point the wind vane in the right direction. The station’s setup instructions will tell you how to align it correctly. Look below for hands-on reviews of the weather stations we’ve tested. We will expand our coverage over the coming months, and we’ll add new features to look for as they come up. For budget-conscious weather watchers, it doesn’t get much better than My AcuRite. A less-than-intuitive installation and sometimes inaccurate readings, however, were disappointing. 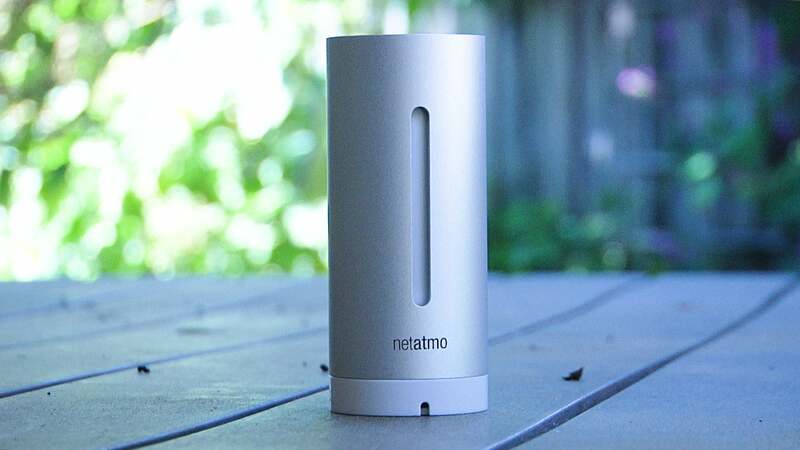 Netatmo’s Weather Station is the personal weather station of choice if you have a smart home system or are planning to install one. While it is somewhat pricey and does have some quirks, its accuracy and feature set is impressive and hard to beat. The Vantage Vue is our top pick for weather enthusiasts. For everyone else, there are less-expensive alternatives that are nearly as accurate. This unique concept adds a webcam to a home weather station, but you'll need to buy a second kit to get all of the sensors you'll need to monitor the weather.